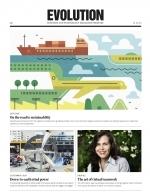 Evolution is a business and technology magazine issued by SKF and is available in both print format and online. Evolution is published in 10 language editions – British English, US English, Chinese, Czech, French, German, Italian, Russian, Spanish and Swedish. 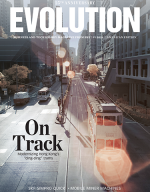 The online version of Evolution publishes articles on a continuous basis. The articles offer information on topics of current interest and also provide information about SKF technology and solutions, products and services, and customers around the world. The print magazine is published four times a year and contains a collection of articles from the online magazine. Evolution is issued for informational purposes; the information provided is of a general nature and should not be treated as advice or be relied upon for making decisions or for use in a specific matter (see terms and conditions). The opinions expressed in the articles are those of the authors or people interviewed and do not necessarily reflect the views of the editors or SKF. Design, page layout and technical solutions for the web magazine are supplied by Appelberg Publishing, Stockholm, Sweden. Editorial management, design, layout and prepress production of Evolution print magazine are supplied by Appelberg Publishing, Stockholm, Sweden. Reprint is only allowed by permission of the editor in chief.